For more than 35 years, Oil States skirt pile grippers have been a fast, reliable and economical solution to temporarily hold the jacket to the skirt piles. Radial gripping devices are welded into the jacket’s skirt pile sleeves during yard fabrication. During the installation process, the lowest corner is raised to level, and the grippers are actuated to hold the position. This is done for all four corners to maintain position until permanent pile-to-sleeve connections are completed using either conventional grouting or Hydra-Lok™ pile swaging. Grippers can be readjusted, as needed, before permanent connections are made. Grippers are available for any size piling diameter or weight capacity. Models include standard, collet, packer or spring actuated. Compact design to reduce length of skirt pile sleeve. Radially mounted hydraulic actuators are in the sleeve. Hydraulic or pneumatic rams are activated via stainless tubing lines from the surface. Powerful gripping force from hardened steel teeth. 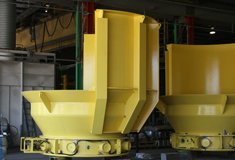 Bi-directional gripping up to 5,000 tons and 136″ diameter. Can be used with grout shear keys.